WeAreTheCity includes gender-related news, a networks directory, calendar of events and conferences, returnships, business schools, inspirational women profiles, HeForShe interviews, giving back and jobs. Career-related content to inspire and motivate our members (+7000 articles) to drive their careers and achieve their potential. WeAreTheCity has an extensive calendar of UK events that our members and site visitors can attend in order to upskill and build their professional networks. WeAreTheCity actively encourage our members and site visitors to give back and help others through volunteering activities, public appointments, trustee positions, working with schools and charities. 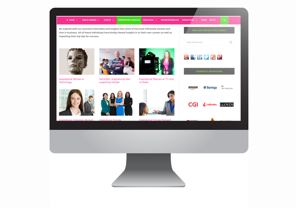 WeAreTheCity promote career opportunities through our sister site, WeAreTheCityJobs. We don’t just publish open roles, we work with our clients to embed their brand as an employer of choice for women. WeAreTheCity run their annual Rising Star Awards which highlight the achievements of 100 women below senior management both in the UK and India. We also promote the awards’ activities of over 15 different awards bodies across the multitude of sectors.